Turbine, I hereby forgive you – at least temporarily – for as yet not offering a dretch cosmetic companion, because Even has found something else to occupy her leisure time. The epic feat Scion of Limbo is rather nice in itself; it gives you a random buff that changes once per minute. Boosts to damage, PRR/MRR, heal amp, etc. – there’s a lot to like. It’s WAY cooler than that. 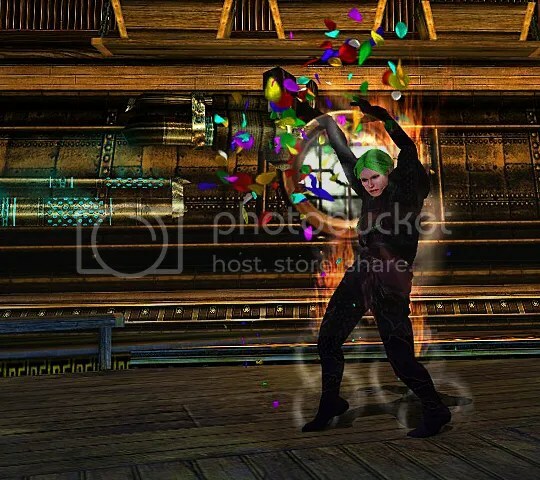 One of the random buffs MAKES CONFETTI EXPLODE ALL AROUND YOU. It’s kind of like automatically drinking a Potion of Wonder once a minute, except all the effects are beneficial, and one of them is CONFETTI! Oh I dont know. I think its cause there are green flakes in it, thats what has got you hooked. Admit it! Happy New Year too. You keep using that word (“normal”) – I do not think it means what you think it means. @Slvr: If she could, she would! @Keava: KEAVA! Yes, the green flakes definitely don’t hurt! Pingback: DDOCast 414 – DDO Debates: Gnomes « DDOcast – A DDO Podcast!